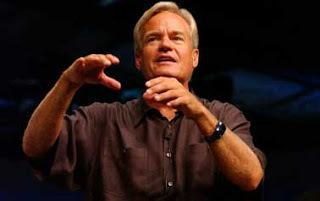 Bill Hybels said in a message last year that passion is one of the defining characteristics of young leaders. He also talked about how that passion has a tendency to wane in an individual’s life over time. While validating the power of passion in a young leader’s life he also challenged those by saying that passion alone cannot sustain the life and ministry of a leader. Skill must be added to the equation. In fact, skill, experience, wisdom and resources are four things that most young leaders don’t have in abundance, as least when compared to their later years. Obviously some young leaders have way more skill, experience, wisdom and resources than their peers but they probably don’t have more than they will have thirty years down the road. Why is it though that over time passion seems to decrease as wisdom, skill, experience and resources increase? Some might argue that the idealism and passion of a young person is not sustainable but that it lays the tracks for the rest of an individual’s life. Almost like you want to get that passion as high as you can at it’s peak so that you can ride it out for as long as possible. For those 45 and older, (I’ll call that a generous halfway point in life) are you more passionate or less passionate about the things that once fueled your fire? Has your passion increased or decreased with each passing decade? I want to see my passions, by the time I’m 45, double from the point they’re at now. I hope I’m more focused, more committed, more sacrificial, more fanatical and more determined than ever by that time. What do I need to do to make this happen? How do I stir and stoke my passions so that they don’t atrophy? I do realize that the idealism, almost by definition, has a hard time not getting beaten down by the sad realities of life in the world today. But passion is different than idealism. When I look at my heroes, (let’s leave Bill Clinton out of this discussion, he’s more of a lower-case “h” hero to me compared to the capital “h” heroes in my life, Hudson Taylor, A. B. Simpson and the like) they are often individuals whose passion grew as they aged, adding to it wisdom, experience, skill and resources. Their strength of heart (passion) acted as a catalyst to develop both strength of mind and hands. Are these the people we read about that inspire us to look at our own lives and challenge us in ways we’ve long given up on? I’m working on my Master’s in Intercultural Studies right now, actually I’m writing this post because I’m avoiding doing my homework at the moment, but how sad would it be if this degree and these studies merely added letters to my name and knowledge to my mind yet in doing so replaced the passion in my heart? Here’s what I’m not saying—that those I observe older than me are passionless. Here’s what I am saying—why is passion something we more often associate with being young? ...the other day with a friend of mine named Don Bubna. I feel incredibly fortunate that this treasure chest of wisdom, insight, and life-changing questions is willing to spend a morning walk with me every once in a while. Don asks questions in a way that reminds me of my Dad, the good kinds of questions that get you thinking about things you hadn't thought about and lead you down a trail of self-discovery. Sometimes I get nervous because I don't know where the questions are going to head and I always wish I was a little further along than I ever am. On this day, however, I turned the tables for a moment and asked Don a question about his life. My question was this: Looking back on all your decades in ministry (six, I believe), which one do you feel was your most significant? What do you think he said? He answered by saying, "this current one." He didn't even need to think about it very long. Keep in mind that this guy used to write for Christianity Today, Leadership Journal, has a few Doctorates, pastored a megachurch for a quarter century, and none of those took place in this current decade! But I believe he's right in that his influence and his effectiveness in ministry are at an all-time high. Here's where that answer took my thoughts and what I can't stop thinking about... If you knew that your most effective years/your greatest contribution would come in your eighth decade of life, how would that change the way you live now? I made some absolutely fabulous friends in college that inspire me, provoke me, encourage me, and join with me as we all try to live radical lives committed to Christ. We're all different in our passions, gifts, backgrounds, majors, zip codes, and telephone answering frequency but I feel in a way we're all still connected. The group has grown as well as spouses and offspring join the picture. Kurbis was one of those friends that while none of us knew exactly he would do someday we all knew that it would make us stand in amazement. 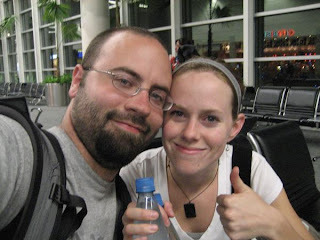 He and his wife, Bethany, are moving to Sudan to work as the area coordinator for the American Refugee Committee. I just think that's pretty cool and I hope that some of our middle schoolers grow up to engage their faith, world, and lives to the extent that Brian and Bethany are, go Kurbisses's' Check out their world here! William Jefferson Clinton. Apparantly Jimmy Carter made it cool to have a life after your presidency and Bill is following suit in a way that I find to be incredibly cool. This guy is an absolute machine. He's using his incredible favor around the world to connect people, raise billions and calling people to action. 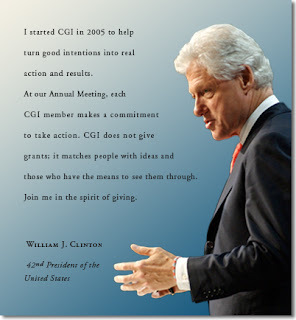 His new organization, The Clinton Global Initiative is doing some incredible stuff. He recently won the TED Prize for one of his current ideas: "I wish you to help create a better future for Rwanda by assisting my foundation, in partnership with the Rwandan Government, to build a sustainable, high quality rural health system for the whole country." When asked by Peter Jennings a little bit ago who he'd most like to meet, he answered, "I would like to meet the new President of Kenya because he abolished school fees for poor children and a million extra children showed up at school." As President Clinton articulated, the abolition of school fees in just one country was, " likely to affect more lives positively than almost anything any other political leader will do this year." His latest book sold more than any other book in the country two weeks ago, according to USA Today, and is called, Giving. This dude rubs shoulders with some of the brightest, most accomplished, wealthiest and influential people in the world and asks for checks bigger than they've ever written to be given to the world's neediest causes. That's cool. Here's to my hero of the moment...who's yours?